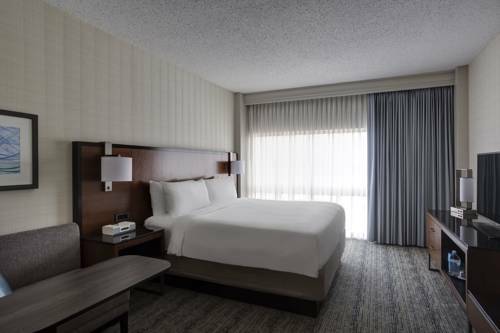 Possibilities take flight at Houston Airport Marriott at George Bush Intercontinental, conveniently connected to all IAH terminals via underground tram. Whether traveling for business or leisure, discover a refreshing atmosphere with friendly staff members, elegant event spaces and reimagined guest accommodations. Indulge in dinner and drinks at our on-site restaurant, Flight's Lounge & Grill, or order room service to your private space with designer bedding and high-speed internet access. Our Texas-sized Greatroom and premier M Club Lounge provide additional room to recharge, connect or unwind with friends and colleagues. With over 30,000 square feet of event space equipped with the latest technology, our hotel can also host sophisticated conferences and social celebrations. During downtime, get in a workout at our state-of-the-art fitness center, or take a much-deserved dip in the outdoor saltwater pool. Book a stay today in one of our reimagined rooms, reaching new heights among Houston airport hotels! For the traveler looking to escape square meals, we offer Flight s Lounge & Grill. From a breakfast buffet to locally sourced regional favorites, this lobby-adjacent restaurant satisfies travelers schedules and appetites.